You can view, add, edit and delete server nodes from Anaconda Enterprise using the Admin Console’s Operations Center. If you would prefer to use a command line to join additional nodes to the AE master, follow the instructions provided below. Each installation can only support a single AE master node, as this node includes storage for the platform. DO NOT add an additional AE master node to your installation. As a best practice for etcd optimal cluster size, we recommend you add any additional Kubernetes master nodes in pairs, so that the total number (including the AE master) is an odd number. Anaconda Enterprise doesn’t support running heterogeneous versions in the same cluster. Before adding a new node, verify that the node is operating the same version of the OS as the rest of the cluster. If you’re adding a GPU node, make sure it meets the GPU requirements. Select Servers from the menu on the left to display the private or public IP address, hostname and profile of each node on your system. Click the Add Server button at the top right. Select an appropriate profile for the server and click Continue. Copy and paste the command provided into a terminal window to add the server. When you refresh the page, your server will appear in the list. 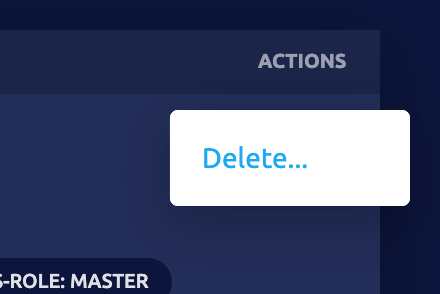 Click on the IP address of the server you want to remove, and select Delete. 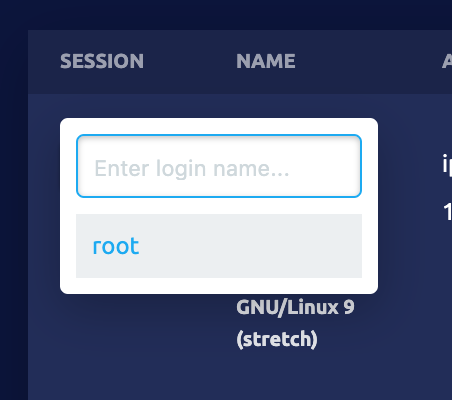 Click on the IP address of the server you want to work with, and select SSH login as root to open a terminal window. When you are finished, simply close the console window by clicking the icon. 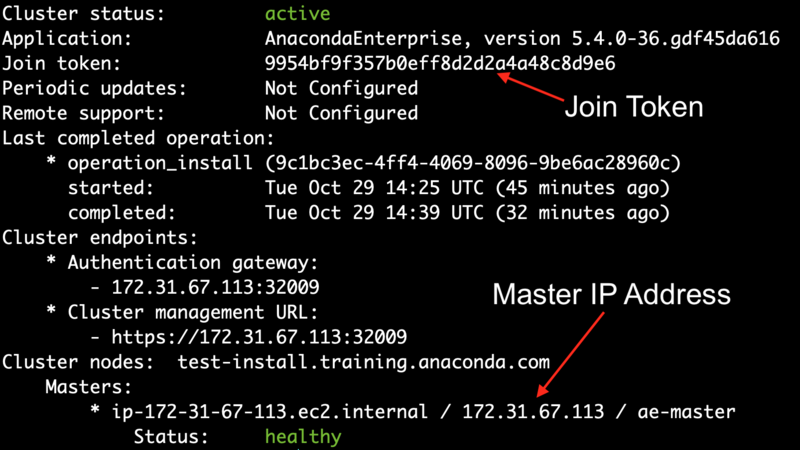 Download the gravity binary that corresponds to your version of Anaconda Enterprise from the S3 location provided to you by Anaconda onto the server you’re adding to the cluster. Copy and paste the join token for the cluster and the IP address for the AE master somewhere accessible. You’ll need to provide this information when you add a new worker node. You’ll also need the IP address of the server node you’re adding. JOIN-TOKEN = The join token that you obtained in Step 3. NODE-IP = The IP address of the worker node. This can be a private IP address, as long as the network it’s on can access the AE master. NODE-ROLE = The type of node you’re adding: ae-worker, gpu-worker, or k8s-master. CLOUD-PROVIDER = This is auto-detected, and can therefore be excluded unless you don’t have Internet access. In this case, use generic. MASTER-IP-ADDR = The IP address of the AE master that you obtained in Step 3. To monitor the impact of the join operation on the cluster, run the gravity status command on the AE master.